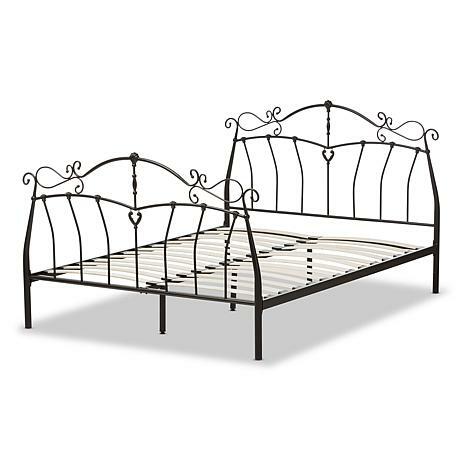 The Selena modern classic queen size metal platform bed offers graceful lines and delicate castings in a truly ageless modern classic style. 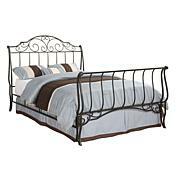 The scrollwork design adds an attractive look to any bedroom with a contemporary twist. The Selena is constructed with heavy gauge fully welded metal and is finished in black finish matching your other vintage furniture pieces. It comes with sprung slats to serve as the platform. Hardware and assembly instruction comes with the shipments of two cartons. Made in Malaysia. Dimensions: 46.85" High x 62.52" Wide x 83.46" Deep; Headboard: 46.85" High x 62.52" Wide x 1.5" Thick; Siderail: 1.97" High x 80.47" Long x 0.98" Thick; Footboard: 30.12" High x 62.52" Long x 1.5" Thick; Slats: 2.48" Wide x 29.92" Long x 0.35" Thick; Legs: 12" High; Inside Dimensions (Mattress Size): 61.02" Wide x 81.5" Deep Dimensions: 46.85" High x 62.52" Wide x 83.46" Deep; Headboard: 46.85" High x 62.52" Wide x 1.5" Thick; Siderail: 1.97" High x 80.47" Long x 0.98" Thick; Footboard: 30.12" High x 62.52" Long x 1.5" Thick; Slats: 2.48" Wide x 29.92" Long x 0.35" Thick; Legs: 12" High; Inside Dimensions (Mattress Size): 61.02" Wide x 81.5" Deep .